Noah’s Ark began as a story about a magpie who couldn’t sing and became a hero when she saved a small town from an approaching bushfire. Along the way the story morphed into something quite different, but with elements of the original story remaining. The story was published in ‘Touchdown’, a magazine produced by The School Magazine in June 2016 and illustrated brilliantly by David Legge. As dawn’s light crept across the tree tops Noah Jones climbed the fire tower. He gazed over the mountains that hunched like a sleeping dragon. Far below in Tarara magpies welcomed the day with soft warbles and a butcher bird piped a song of hope, but the currawongs were silent. The townsfolk rubbed their sleepless eyes and sighed for rain. High in the mountains flames licked at the splintered carcass of a shattered tree. Wisps of smoke curled into the air and orange fingers whispered across the forest floor. Wallaby sniffed the air before bounding off. Wombat’s whiskered nose twitched in alarm and lyrebird’s delicate tail trembled with fear. Echidna tasted the air before shuffling away and gang-gang cockatoos burst like fire crackers into the sky. When Noah saw the flames racing up the mountainside he knew the dragon had awoken. A fiery storm of burning embers spewed from the dragon’s cruel mouth and swirled around the fire tower. In Tarara the fire crew scrambled aboard their tanker and as they rumbled down the main street the townsfolk’s hearts tightened with fear. The air filled with choking smoke and the sun was soon lost in a blood red sky. The wind howled through the treetops and the mountains erupted into dancing dervishes of flame. When Noah clattered down the ladder he found the animals waiting. It was as if they knew he was their only salvation. As Noah’s ute careered down the track laden with its precious cargo he prayed that Tarara had not felt the dragon’s blistering breath. Near the bottom of the mountain a tree toppled across the track. Noah stumbled from the ute, searching for an escape, but there was none. 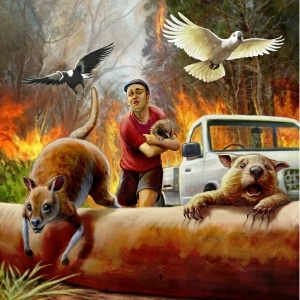 The wallabies thumped their tails and crashed through the bush, followed by the others. Close behind came Noah, for there was nowhere else to run. And suddenly Noah understood when he saw the pool of black water; a refuge from the firestorm raining overhead. Noah huddled in the water as the inferno swept over them and when the flames had passed he heard the calls of the fire crew and knew there was still hope.